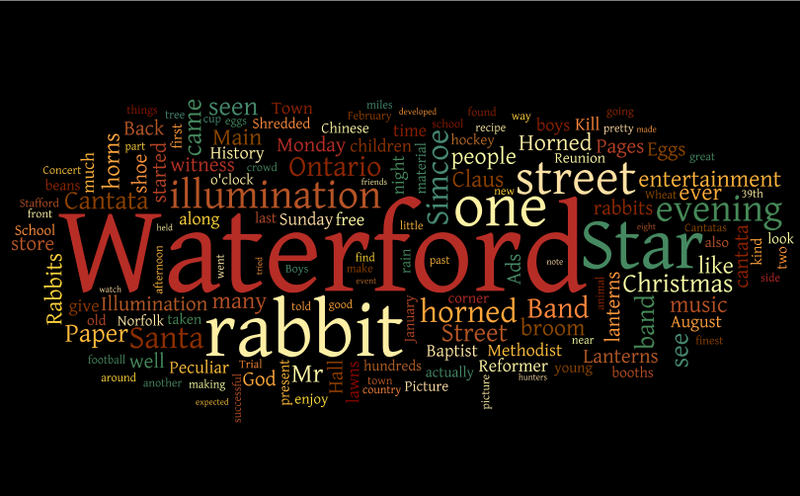 I do "local history light" concentrating on the town of Waterford, Ontario, Canada and the surrounding area. I keep tripping over odd things that don't fit anywhere. I've never come up with a good way to organize them. This is because I don't enjoy organizing things. But I do enjoy making websites. So I thought I'd organize them here for all to see. So, this website amounts to a collection of stuff found on Our Back Pages. Not only that, it is the only source of reliable news information on jackalopes. and much much more, presented with no formality apart from documenting sources. There are references to non-local material in a free-associative kind of way. The site is under construction - I am adding material as time and inclination allow. I reserve the right to be totally idiosyncratic. Also - a disclaimer up front - sometimes some of the material in older sources is offensive in one way or another. I don't like it, but what can you do? Waterford actually seems to have been a reasonable town in terms of racism and sexism - for its time. 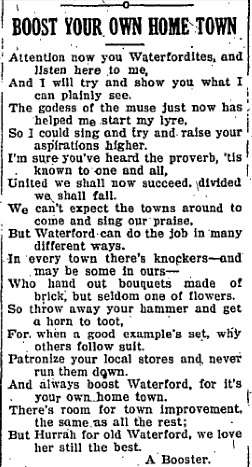 Overall, I have noted a tendency to "tolerance" (that unfortunate word) in the older papers. At the same time, I have also encountered extremely offensive language. I am not seeking this material out, but I also won't censor it if the item is otherwise interesting. I don't own the material I quote, but it has taken a lot of effort to find, recognize, assemble and present it. All I ask is, if you take anything from here, please give credit and a link back to this page.